The below text is by Lauren Grieco and was lifted directly from FRAME MAGAZINE. 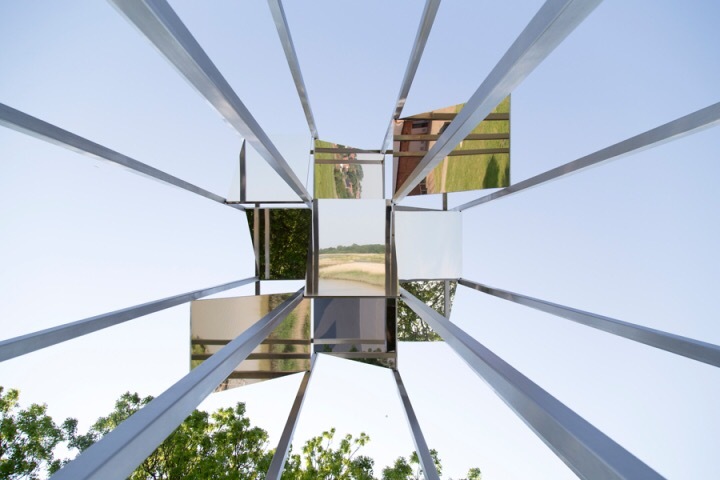 CORD crafts a multidirectional periscope for children to view distant vistasSUFFOLK – Snape Maltings, an art complex which is also the home of an outdoor sculpture garden, concert hall and the Aldeburgh Festival, sits amid a picturesque landscape along the coast. 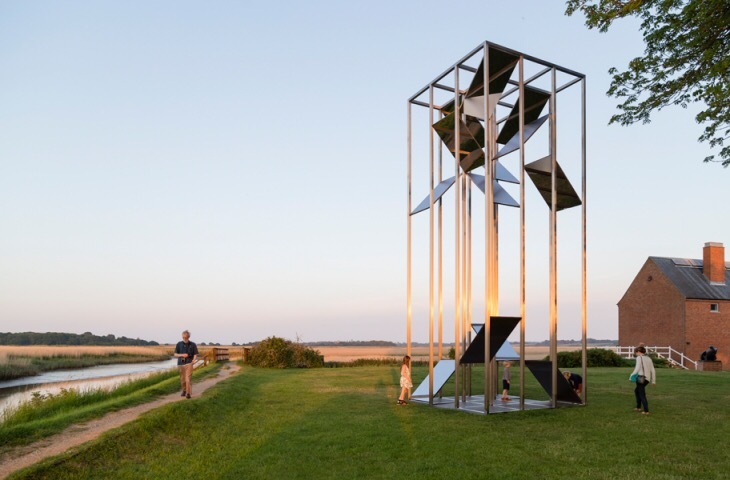 To join the noteworthy artworks by Henry Moore, Barbara Hepworth and Sarah Lucas, the Aldeburgh Music and Suffolk Coastal District Council called for a sculpture which ‘offers a vantage point across the marshes at Snape’. Artist David Rickard and architect Germano Di Chello responded with an out-of-the-box solution which reflects its surroundings. Hailing from New Zealand and Britain respectively, the London-based interdisciplinary duo brought together their complementary backgrounds to form Collaborative Office of Research and Design (CORD) in 2011. Instead of a conventional stairway leading to a platform to overlook the rolling countryside, Rickard and Di Chello let curiousity seekers keep their feet firmly planted on the ground. Stretching skywards from a square footprint, Myriad is a steel tower which reaches nearly nine meters in height. 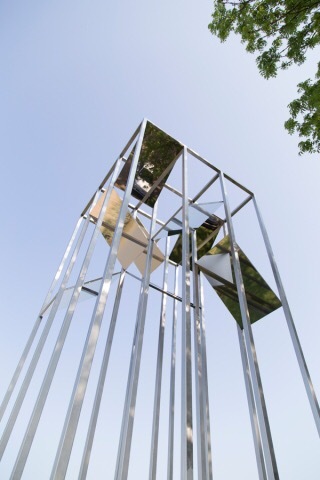 Secured within the metal framework, mirrored and brushed steel panels at its base and zenith of the columns work together to play upon the principle of a periscope. As children and adults gaze into the low-lying mirrors, glimpses of the distant landscape appear.